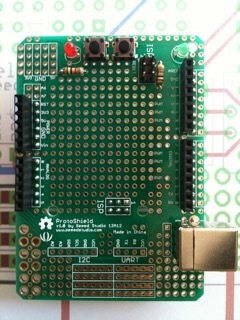 Composer Bob Hoehn soldered together a ProtoShield for the Arduino Uno. The Resonant Nest reads sensor cues from weather and feeds a composing program, MAX, to change the score over the course of the day depending on temp, pressure, cloudiness, wind. Part of being a nerd is wallowing in obscure terminology. Basically this is the prototype daughter card (the Emma–after Jess’ daughter) which attaches to the Arduino mother card (the Jess). All the sensors will get attached to Emma (above), Jess handles the power supply and communications. vroom vroom.